Assessment: Volume 1 (SG24-8007) describes how to evaluate the requirements of a new Smarter Analytics workload, addressing the user, system resources, and data processing profiles to identify the most optimal configuration by using IBM methodologies, such as fit-for-purpose. Given that the existing showcase is based on the IBM zEnterprise® System, deployment options include IBM z/OS®, Linux on IBM System z®, IBM AIX® running on IBM POWER® processor-based blades within the zEnterprise BladeCenter® Extension (zBX), and Windows Server 2008 running on System x® and BladeCenter blades also within zBX. 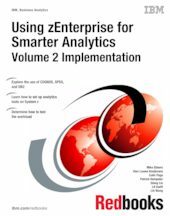 Implementation: Volume 2 (SG24-8008), which you are reading, describes the setups that are involved in deploying the Smarter Analytics workload within the showcase. With multiple components, including IBM Cognos® BI, IBM Cognos TM1®, Cognos Metric Studio, IBM DB2® for z/OS, and a number of application design tools, the workload spans multiple operating environments. The use of application clustering, setting up performance policies by using Unified Resource Manager, and simulation test execution results are included.